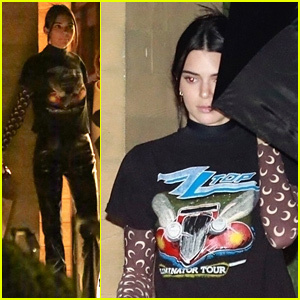 Hailey Baldwin Pays Tribute to a Late Singer at Lunch wtih Kendall Jenner | Hailey Baldwin, Kendall Jenner, Sheer | Just Jared Jr.
Hailey Baldwin makes her way out of Bar Pitti after having lunch with friend Kendall Jenner on Monday (July 31) in New York City. The 20-year-old model was seen wearing a shirt that was a tribute to the late singer Aaliyah, who died in a plane crash in 2001. Kendall was seen wearing a see-through top without a bra, the second time she did it in two days!